Reading is an activity, so all reading activities must be active to a certain level. It is impossible to be truly passive in reading because we cannot read without moving our eyes and mind. Therefore when we compare between active and passive reading, the goal is, first, to show that reading can become more or less active, and secondly, to show that the more active reading is the better. A reader get better than other if he try to undergo more diverse activities in reading. He is a better reader if more demanding of himself and the text he read. 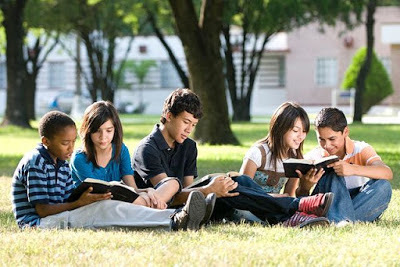 Although it may not be totally passive during reading, many people assume that, compared to writing and speaking that is clearly active, reading and listening are total passivity. The writer or speaker must do a number of activities, but the reader or listener does not need to do any effort. Reading and listening are considered as receiving communication from other people who are actively writing or sending it. Receiving communication is considered same as receiving a punch, inheritance, or verdict from the court. That assumption is wrong. Readers and listeners are more like ball catchers in baseball. Catching a ball is an activity too, just like throwing or hitting a ball. The thrower or bat is the sender, meaning that their activity causes the ball to move. The catcher is the recipient where the activity causes the ball to stop. Both are active even though their activities are different. The passive is only the ball. It is an inanimate object that is moved or stopped, while all the players are actively throwing, hitting, or catching. This analogy is almost perfect. Material written and read, like a ball, is a passive object between the process of starting and ending. This analogy can be used one step further. The art of catching is the skill of capturing various types of throws. Similarly, reading is the best possible skill for various types of writing. It should be noted that players can achieve success only if the thrower and catcher of the ball work together, as well as the writer and the reader. The author does not try to be incomprehensible, even though sometimes it does. Communication is successfully established if what the writer want to convey can be accepted by the reader. The skills of writer and reader are directed at the common goal. Admittedly, there are various writers. Some writers have very good "control". They know exactly what they want to say, and they deliver it accurately. In general, they are easier to understand than "wild" writers without "control." We cannot continue the analogy again. The ball is a simple unit, it can be captured completely or not at all. However, writing is a complex matter, it can be understood more or less thoroughly, starting from very little to the whole idea of the writer. The amount that the reader can understand depends on how active he is in the process, and also how skilled he is in undergoing relevant mental actions. What is the use of active reading? This question we will often face. For now, it is enough to say that a reader is better than other readers if he, first, read more actively, and second, is more skilled in undergoing various relevant mental activities. These two things are related. Reading is a complex activity, just like writing. It consists of many separate mental actions, and all must be done in order to read well. People who are more skilled at doing it will read better. Reference: Mortimer J. Adler & Charles van Doren, How to read a book: The Classical Guide to Intelligent Reading, 1972.